I have so many memories of grabbing White Castle Cheeseburgers when we would go to Nashville to visit family or whenever we would pass one on the road during a trip. They are now a big favorite with my family. Whenever the kids see a White Castle, they always want to stop. Where we live, we have Krystal. It’s very similar but not the same. One day I went on a quest to try my hand at making some of my own here at home. I loaded up trusty Google and found quite a few recipes. Some called for bread crumbs, others for peanut butter. Yep, you heard that right. I made up my own little recipe using a combination of several that I found online and they are perfect! The boys gobble these right up! Please excuse the pictures but it was after dark when I made these and we were all starving, so I just grabbed a couple quick pictures to get these on here for you guys. I will update the pictures later. Spray a large lipped cookie sheet with cookie spray or line with parchment paper. In a large bowl, mix together the ground beef and onion soup mix. Gently press the ground beef onto the cookie sheet. It should make a nice thin layer over the entire sheet. Sprinkle the minced onion over the meat and pat down. Bake in the oven to 20 minutes. The meat will shrink up and pull away from the edges. You'll end up with about ¾ of a pan of meat. When done, remove from the oven and soak the undersides of your buns in the excess grease in the pan. This is what makes them taste even more authentic! Now top the meat evenly with American Cheese slices and cook for 2 minutes to melt the cheese. Remove from the oven and let rest for just a couple minutes before using a pizza cutter to cut into patties. Now put your patties on your hamburger buns and serve! Optional: You can add condiments of your choosing. 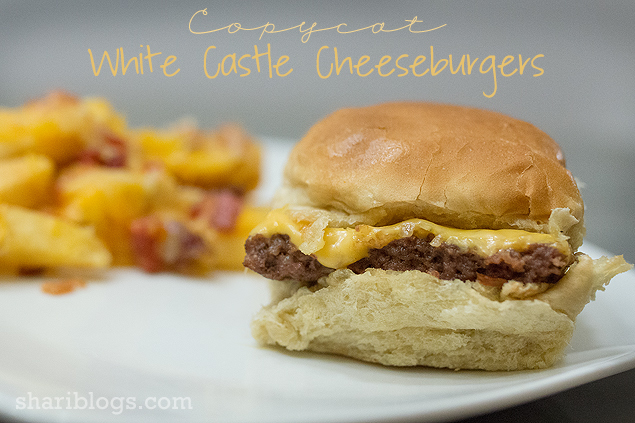 pickles, ketchup and mustard are standard on the real White Castle burgers. What is your favorite fast food burger place?? Besides White Castle, I like Wendy’s, Sonic and Five Guys. Yum! Thanks for your sweet comments, Andi! I think you should definitely whip up a batch! I’ll admit it … I love these. The lipton soup mix is genius. I bet it makes it taste just like them. Hi Shari! 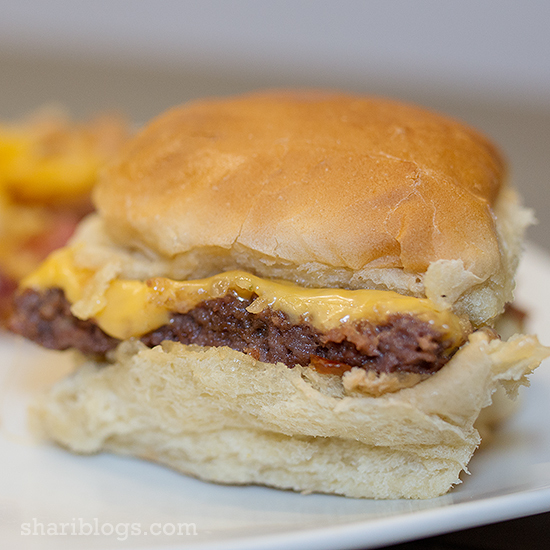 I just wanted to let you know that I will be featuring your mouthwatering cheeseburgers on my blog later tonight! Thank you so much, Gwen!! I really appreciate it! Great collection you put together! Happy Friday! 🙂 I am here to let you know that your fab recipe is one of my favorites from last week’s #GetHimFed Linky Party! You are welcome to come to my blog, grab a featured button, and join the party again 🙂 Congrats! I used your recipe tonight and loved it. They tasted great! I used to live in Michigan and loved going to White Castle. Then we lived in Kentucky and they had a Krystal’s, I must agree they are good but not the same. Hubby just finished making these and they are delish! Well done!